I don't know how many Alteryx users are familiar with Microsoft's SQL Server Integration Services (SSIS)? 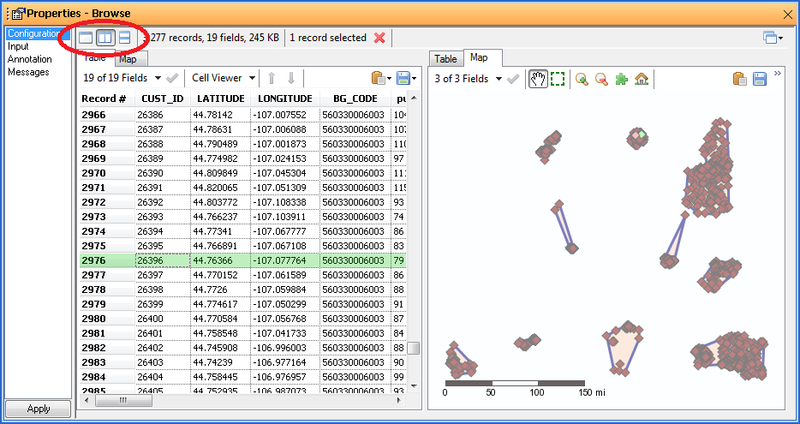 It is Mircosoft's attempt at an Alteryx Engine type tool which I could write a whole article about. But I'm not going to risk boring you with what I see as SSIS's shortcomings. All I will say is I was very disappointed with SSIS when it was released and when I started using Alteryx I never looked back. However this time last year there were two features of SSIS which I thought Alteryx lacked. The first was the ability to hide away sections of the module in collapsible sections. At Extend 2010 Ned demonstrated this same functionality in Alteryx courtesy of Tool Containers. 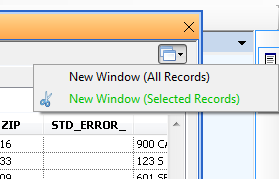 After that demo I mentioned to Ned that now there was only one thing which I thought was better about SSIS than Alteryx, namely the displaying of record counts on data connections. Please let me know if there are any more that I have missed off the list. A slightly belated post due to my busy life at the moment, but no less exciting for the delay. Alteryx 2011 is now released! Check out the offical blog here. It comes with a whole host of exciting new features which are going to enable users to do more with Alteryx and do things more easily! New charting tool with new chart types including a box and whisker chart. Looks like it's going to be an exciting release! Look out for blog posts on some of the new features here when I have a bit more time. Inspiring Ingenuity is one Alteryx's taglines and I think the module I will cover in this post is a great example of a way to solve a problem using the tools in a way they were never designed for. However (and hence the title of the post) I wonder whether my solution is clever for the sake of being clever and in reality there is a simpler solution which I have just overlooked. The principle is popularly summarized as "the simplest explanation is usually the correct one." I've also heard it stated as "The simplest solution is the best solution". Now this isn't quite the version I subscribe to. Consider the example in Alteryx of needing to match against a large lookup file of several million rows on a regular basis. Well the simplest solution would be two input tools, a join and browse. But is that the best solution? Well if the time it takes for the module to run is important to you, then no. A better solution would be to load your master file into a Calgary dataset, index the columns you need to match on and then rebuild your module with an input tool, Calgary append and browse. More work to set up, but in the end a better solution. in other words complexity in a solution should only be there if it is necessary. So in our above example we introduce the extra complexity of loading our data into Calgary to make our solution run faster. Which brings me to a question about my module. Is the complexity of my solution necessary or can somebody think of a simpler solution? We have an Alteryx server which can run up to four Alteryx modules simultaneously. Every time a module is run the start and end time of that module is logged in a SQL server database, which is then used for looking at how the server is being utilized (using Alteryx to generate the reports of course). So one of the metrics we are interested in is server utilization: how much of the processing time of the server did we use last month? How much more capacity have we got until we need to get a second server? How much time is the server completely idle? I'm going to leave you to think about possible solutions and post my proposed solution in the next post. If you want to have a go then I've provided my example data below to see if you can match my answer. I have a an Alteryx module that reports project data and milestones for various projects. What is missing is a visual representation of the milestones and I was wondering if anyone had used the Alteryx reporting tools to create a Gantt Chart type view of milestones/tasks. We do not currently offer a Gantt Chart option in the Chart tool. Thank you for expressing an interest in this feature, we will look into it as a possibility for the future. While Brett's reply is quite correct; there is nothing to stop you creating your own Gantt Chart using the tools currently available in Alteryx 5.0. If anyone remembers the techniques which were used to create a polar graph or a chess board which used the mapping tool as a custom renderer, then a similar technique could be used to create a Gantt chart. The module uses a couple of interesting techinques including using the Generate Rows tool to create a data row for every day between two date ranges and generating the spatial objects needed to build up the Gantt charts by dynamically creating json objects (Thanks Ned). The things that need doing next with this are to take a look at the scaling aspect (it currently doesn't look so good for timeframes longer than a month) and turn the whole thing into a macro which outputs a report . As always any questions/comments please post below or feel free to contact me directly. The humble browse tool is probably the most used tool in the Alteryx toolbox, it is a great way to take a look at your data at any point in your module; but how many of you use more than its default settings? Score yourself out of ten for how many of the following tips and tricks you already knew about the browse tool. Great for when you need to check two fields against each other. 3. 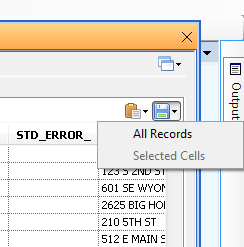 The "Cell Viewer" button lets you examine the contents of an individual cell and with "Show Whitespace"
6. In the split map/data table view. 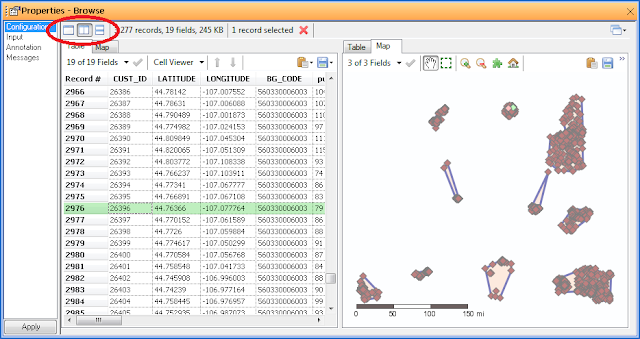 Selecting a data row in the table will highlight that spatial object on the map and selecting a spatial object on the map will highlight the corresponding data row. 7. Need to compare records from two different browses in the same module? No problem! 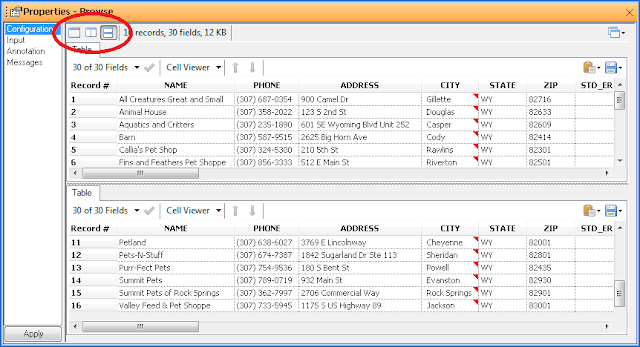 The new window button will create a new floating browse window of the current data; then switch the original properties window to the other browse and compare away. 8. 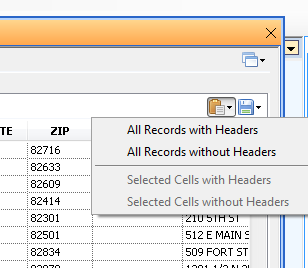 You can save records (all or a selection) directly from the browse tool. Useful when you have spotted an issue and want to send the records to someone or do some further analysis elsewhere. 10. The browse tool will display up to 1 billion rows. After that it only displays alternate rows, but maintains the correct row numbers in the first column. So how many did you score out of ten? Post your scores in the comments below and let me know if you think of any others I have missed. It was great to see such a good attendance for this; I thought it was a really interesting event. Thanks to all the other presenters for sharing what they are doing with Alteryx. Following on from Ron's great post about using HTMLPassThrough here. I would like to share with you all the Street View macro which came out of the same brainstorm in the solution centre at Extend 2010. What it does is allow you to insert a Google Street View iframe into an html report from a given set of x, y co-ordinates without needing to know about HTMLPassThrough or indeed worrying about it. It uses a couple of interesting techniques including HTMLPassThrough and batch macros. I'm not going to go into huge amounts of details of how it works here, the modules are commented so just let me know if you have any specific questions. Only caveats I'm going to throw in for this one is that it is html reports only (it's an iframe after all) and if you are going to use it make sure you do so within Google's licence agreement. My challenge is see how fast you can solve the enigma using Alteryx! In the same way as in the Grand Prix allow yourself thinking time beforehand and start the clock when you drag on the first tool, stop it when you have a solution. This one took me 15 minutes and 45 seconds. Anyone think they can solve it faster? I would like to start by thanking everyone who was involved with the organisation and running of Extend 2010. I thought it was a great event and very well organised. I met lots of interesting people; got to see what others were doing with Alteryx and picked up a few new tips and tricks along the way. This article is my summary of the event. Day 1 - So after registration and lunch the first sessions I attended were the Alteryx Product Training. These were the first part of a series of sessions totalling eight hours covering a range of Alteryx topics. The first two sessions covered Allocate and Solocast before moving on to the basics of Alteryx. Not a lot new for me in these sessions, but giving demo's and training in Alteryx is something I do in my role at Experian, so I found it useful to see someone else's approach to training. The final session on day 1 was the Alteryx User Group Forum. I thought this was a great session to meet other Alteryx users and see what other people are doing with Alteryx. Ron House kicked off the session talking about his blog and had kindly given me five minutes to talk about mine. It was a great opportunity to talk about what I've been doing and why I think interaction among the Alteryx community is important for all of us. We then had a number of speakers from different companies talking about how they are using Alteryx; an excellent opportunity to get new ideas to take back to our own work. Day 2 - There were a few different streams running on day 2 including the continuation of the Alteryx Product Training and the DemographicsNow User group, but the one which I attended was the Developer Summit. This was a series of presentation's by Alteryx employees on a range of interesting topics aimed at the developer user of Alteryx. All of the material from the presentations can be found on the Alteryx team blog here. Session 1 - This was an overview by Ned of the tools in the Developer Tools section of the Alteryx toolbox, essential kit for anyone wanting to build macros, wizards or modules which begin to push the limits of what Alteryx can do. I'd seen and used all of these tools before but was great to get some clarification of exactly what they do behind the scenes. Session 2 - Another session by Ned this time on how to build Alteryx macros. A good introduction on how to get started. Session 3 - This session was run by Rob and covered the new feature of Alteryx 5.0: batch macros. This is a feature I was crying out for while I was using Alteryx 4.0 and so have used a great deal prior to the conference. My summary of the feature is that it starts to let you do loops in Alteryx. Rob presented an interesting demonstration of how they could be used and a real world application. What I found interesting was that relatively few people in the audience seemed to be using this powerful feature (look out for a future blog post on this one!). Session 4 - Now we were starting to get into real developer realms with Linda presenting how to run Alteryx wizards from C#. There's not many presentations you will see with Visual Studio and C# code up on the screen! Session 5 - This was a taster by Iain on the new Alteryx Web Services. This looks like it will be very exciting and I'm looking forward to it being released and hopefully being able to have a play with it. After lunch there was a 'bonus' session with Ned in the solution centre on using the Alteryx SDK to build your own Alteryx tools. Another very exciting topic which opens up all kinds of possibilities for using Alteryx (another topic to look out for a blog post on). Then after lunch we had the Alteryx Grand Prix in which I was a 'driver' and was the reason I had managed to get a ticket to the conference. It's effectively "build Alteryx modules against the clock" and try and be faster than the other nine competitors. It was a lot of fun and maybe got my heart racing more than getting up to talk at the user group forum the day before! Look out for a second article covering this in more detail later. Day 3 - The day kicked off with the President's Opening from Dean Stoecker where the company name change was announced (see my previous post); followed by an amazingly inspiration talk by Erik Weihenmayer the only blind man to have climbed the highest peak on every continent, including of course Mount Everest. The rest of the day had a number of speakers from different companies talking about how they were using Alteryx in their businesses. Though I must admit as a developer I didn't attend all of these, instead spending a fair bit of time in the solutions center talking with the Alteryx product developers. Something which I found very useful, so thanks everyone for your time. The other interesting session in the day was a talk by Amy Holland on the future of Alteryx; I'm looking forward to getting my hands on Alteryx 6 already! The day concluded with the awards dinner and then drinks into the evening, a great end to a great conference. I found the whole event really useful and motivational, especially being able to meet other developers and exchange ideas and techniques. I hope I can get there again next year! At the Extend 2010 conference on Wednesday Dean Stoecker, then president of SRC, announced that SRC going forwards will just be called Alteryx. So no more SRC, no more www.ExtendTheReach.com, just Alteryx and www.Alteryx.com. The full announcement can be read here, but from a personal viewpoint I think this is a great move by the company and I think the new branding looks amazing. I'm excited about what I'm sure is going to be a great year for the company and product. Look out for a more detailed report from the conference later in the week and some blog posts on a couple of new macros written collaboratively at the conference. This is a bundle of Alteryx feeds created using Google's RSS reader (cleverly named Google Reader). What you see on that page is all the recent posts from my blog; Ron's blog; the official SRC Alteryx blog and questions posted on the SRC forums. So all you need to do is subscribe to that bundle and you can keep up with all the Alteryx hints, tips and news in one place (http://www.google.com/reader). And what's more if new Alteryx news feeds become available in the future (or if anyone knows of any now that I am missing) then I will add them to that bundle and as a subscriber you will automatically start receiving those feeds as well. So what are you waiting for? Subscribe now! "OK the first thing I have to admit before I start and anyone gets too excited: is my wizard doesn't actually play chess (I haven't got the time to write a chess engine at the moment ;-) ) What it does do is let two users play chess against each other. But with that caveat said, on with the post..."
I'm not quite sure how this particular wizard came into being. I had just read Bill Flanagan's post (here) on using the mapping tool to create a polar graph, which I thought was great; and wanted to have a go myself at creating something custom using the mapping tool. Turned out I couldn't really think of any pressing business problems that I could put this application of the mapping tool to use on; so just for something to experiment with the concept, I thought I would render a chess board and pieces. So one lunchtime using the Alteryx spatial tools and some custom chess piece icons I got from the net, I built a simple module which renders a chess board and pieces. Once I'd got that far I started wondering how difficult would it be to make a wizard which allowed a user to move those pieces around the board? Turns out it didn't need many more tools to allow a user to enter a start and end co-ordinate in a wizard front end and get the piece to move between those locations. Which gives us a wizard which allows two people to play chess against each other! Ever wondered what the point of \0 delimited files would be? Ever wished you could output delimited files with no quote qualifiers? I had done both and having found the answers thought I would share them here. Last week I ran into a problem I have had on a few occasions over the years I've worked with Alteryx. This time round some of the tricks I had used before weren't going to work so I decided to post the problem on the SRC forum. A big thanks to Margarita at SRC, as the same day I got a reply which let me build a working solution! My problem is a seemingly simple one to do with the delimited output file which Alteryx produces. What I wanted to output was a delimited file with a pipe delimiter and no qualifiers. Alteryx does pipe delimited no problem, but when you come to options on qualifiers all you have is the tick box "Always qualify fields" which is either true or false. But there is no option to "Never qualify fields" which is what I want. So as you might have guessed from the title of the post the solution comes from using \0 as the delimiter. What \0 does is produce an output file with no delimiters and no qualifiers, which at first glance might not seem so useful. But what it allows you to do is build up your output file exactly as you want it using the functionality of Alteryx. and then a select to output only that new field to a \0 delimited file. For those of you who haven't read the comments on part 2, Ned Harding has posted some extra information on how the Tokenise Method works here. This shows how you can use the tool to split a field on a RegEx matched delimiter as the help file describes. The last and I think possibly the most powerful of the four methods in the RegEx tool. For this method I am going to leave the e-mail example and take a look at something I seem to be needing to do more and more recently: xml processing. So many applications today are outputting xml files or requiring xml input, that being able to process it efficiently needs to be a staple tool of any data developer. Before I began to learn about RegEx I struggled to process xml using Alteryx as from what I have seen, there are no specific tools for reading or writing it. I was using complex formulas to search for parts of xml strings and then more formulas to extract the piece of data I wanted. With RegEx finding and extracting parts of xml suddenly becomes rather easy. For this example I will use a piece of xml which I hope that anyone who has used Alteryx much will have at least seen, if not manipulated themselves: an Alteryx module. Yes, for those of you that weren't aware, when you save an Alteryx module it is saved as an xml document which, with due care, can be modified in any text editor. Great for those times when you need to rename about 100 fields using a file layout you have been supplied in Excel. The example module uses its own xml as an input and outputs a list of all of the tool ids in the module; along with their types and their x, y display positions. Run the module and take a look at the output browse, then add a new tool, save the module and notice how the new tool you added is now included in the output. 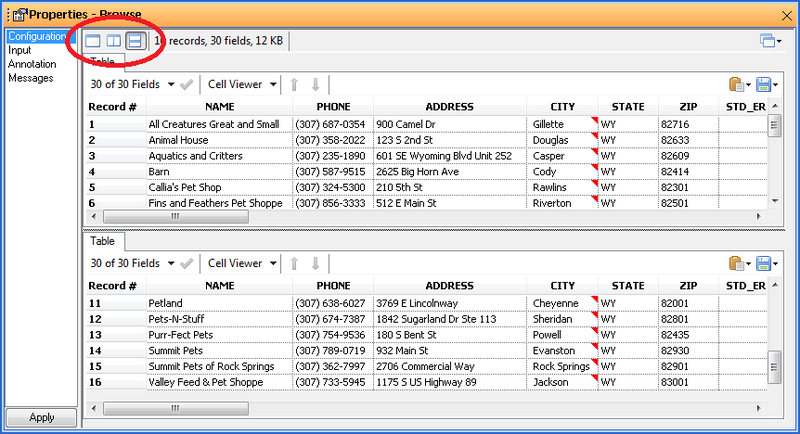 Get the xml into a single field and single row. Use our RegEx replace to extract the required information from the xml. Use Text to Columns tools and a select to format the output. So \r\n is the Regular Expression for a carriage return line feed combination, we have specified that we will replace it with nothing and we have also specified that we will pass all the other unmatched text through to the output as well. I think this could be done using the standard formula REPLACE function, but I think you would need to use the CHARFROMINT function and know the unicodes for a carriage return and line feed, which isn't really any easier. This time we are searching for one or more white space between two > < characters and replacing the whole lot with ><. This is another example of something which I believe would be very difficult without RegEx; you could remove all spaces from the data easily enough, but that would remove spaces inside the tags which we wish to keep. You could also remove a fixed number of spaces between the ends of tags, but to remove an unknown number of spaces I think you would struggle. The final use, having prepared the xml, is to extract the data elements from the xml corresponding to the Alteryx tools. <Node ToolID="(\d+)"><GuiSettings Plugin="([^"]+)"><Position x="(\d+)" y="(\d+)"
notice that I have four marked groups (the parts of the regular expression in parenthesis) representing the parts of the xml data I wish to extract. The power of a RegEx replace is that I can reference these named groups in the replacement text. For example if I made my replacement text $1 then the whole expression would be replaced by 52 (the first marked group) in the above example. This pulls out the 4 pieces of data I want in a nicely delimited format which I can then split into cells by using the text to columns tool, which is what happens in stage 3 of the module. I think that the RegEx replace tool is possibly the most useful of the RegEx tools available in Alteryx and definitely worth spending the time getting to understand. The last thing to complete our overview of the RegEx capabilities of Alteryx is to briefly mention the remaining two functions available in the formula tool. REGEX_COUNTMATCHES takes a string and a regular expression and returns the number of times the regular expression matches the string. REGEX_REPLACE works in a similar manor to the replace method of the RegEx tool, but within the formula tool. One exciting use of this is in the actions of macros and wizards, an example of which I plan to cover in a future post. That concludes my overview of the RegEx capabilities of Alteryx, though my examples are just some starting ideas of what is possible. I hope I have inspired you to learn some basic Regex and next time you are struggling with a complex string manipulation think about using the RegEx toolset. If you have any specific questions or comments on anything I have posted about then feel free to e-mail me or post a comment here.